Three Sea Tow Virgin Islands boats worked together to pull the ship off the rocks. At 5:30 a.m. on Tuesday, Capt. Alan Wentworth, owner of Sea Tow Virgin Islands, got a phone call. As most of us know, when your phone rings at that time of day it’s rarely good news. 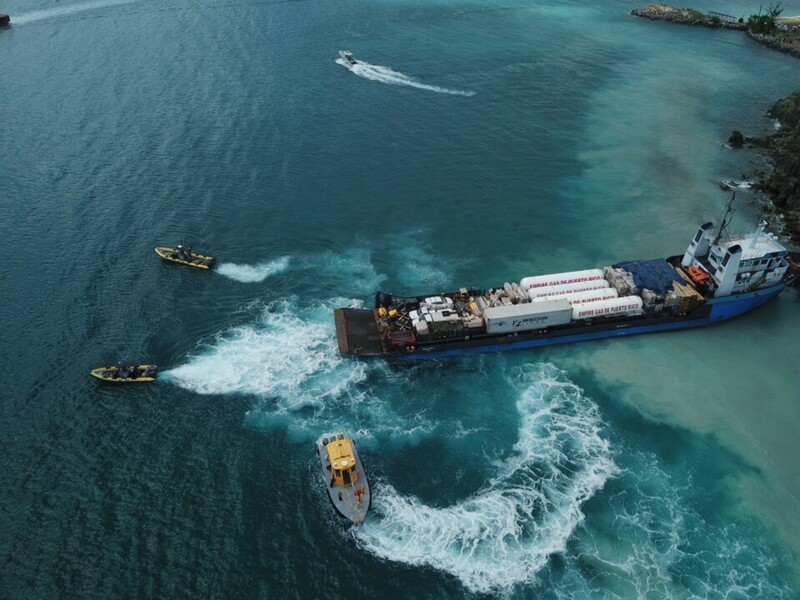 A 223-foot cargo ship had run aground near Charlotte Harbor in St. Thomas, U.S. Virgin Islands. The ship, Ocean Spirit I, was around the corner from Wentworth’s home, so he went down and met with the captain. He and the crew ensured that the hull had not been breached. “They checked the bilges to make sure there was no water coming in and checked that no oil was going out,” Wentworth said. The U.S. Coast Guard also inspected the vessel, and Capt. Anne Allard, the only diver in the Virgin Islands certified by the American Bureau of Shipping, dove beneath the vessel to further inspect it. Wentworth explained that at least half of the vessel, which has an unladen weight of 852 tons, was hard aground. The most serious threat to the vessel was that it was moving back and forth on the rocks beneath it, which was basically the equivalent of grinding a file on the bottom of the boat. The boat ran aground when the captain fell asleep after entering the channel. The ship was coming from Puerto Rico, and was loaded with more than $1 million of propane, lumber, automobiles and other supplies that were needed for continued recovery from Hurricane Maria. About noon, Wentworth and his team from Sea Tow Virgin Islands got to work, pulling with a 25-foot Fluid rigid-hull inflatable powered by twin 250-hp Yamaha outboards and a 36-foot Fluid RIB with triple 250-hp Mercury outboards. Additionally, a 40-foot crew boat with triple 300-hp Yamaha outboards was pushing the boat from both sides and the cargo ship’s twin inboards were in reverse, as well. After about an hour of pulling and pushing, the boat floated free. Wentworth did have a large-vessel salvage company on standby if he determined that his crew couldn’t get the cargo vessel free. Most people would assume that a company such as Sea Tow mainly handles emergency situations involving pleasure boats. Wentworth has been in the U.S. Virgin Islands for 10 years and said he has dealt with a number of commercial-vessel incidents. “We do whatever kind of work comes along down here,” he said.